I have spent some time in recent weeks discussing the use of abrasives in waterjet cutting, and particularly some of the issues that are involved in getting the abrasive distributed relatively evenly through the jet stream, and accelerated to as high a velocity as possible by the time the jet leaves the focusing tube. This issue has become more important as clients request more precise cuts, and edge quality and alignment become more critical. As the jet cuts along a surface the amount of material that is removed (i.e. the depth of cut simplistically) is controlled by the number of particles that impact along that axis. And that, to a degree, is controlled by where that axis lies, relative to the axial diameter of the jet that runs parallel to the direction of cut. 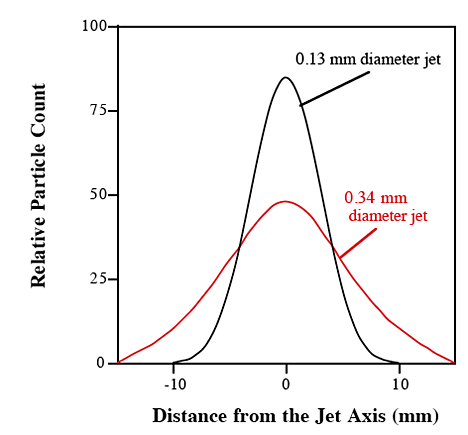 Different conditions give different particle densities, but even within those conditions, the material under the center of the jet will see many more particle impacts than those on the side. As the above figure shows, in order to achieve the best abrasive cutting the rate of abrasive feed must be tailored to the nozzle size and the jet parameters. The density of the abrasive in the resulting stream can be optimized for those conditions and, as discussed in earlier posts, adding too much abrasive to the system will end up being counter productive. 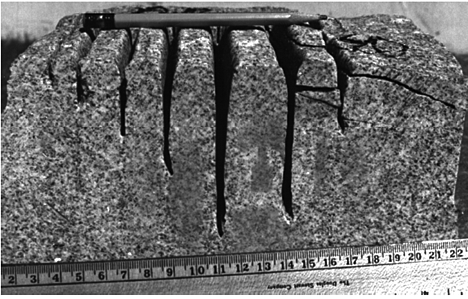 A simple example can show this, in a test where we cut grooves in a block of granite, with the concentration of abrasive in the jet stream increasing with each pass. 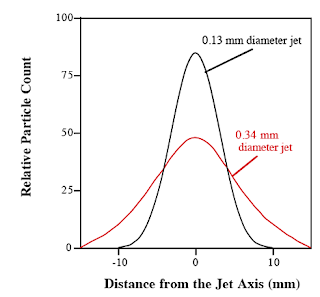 There is, however, a second consequence to the concentration of particles across the jet, and that is that the material under the jet on either side of the center-line of the cut will see a smaller number of particles impacting the surface, than that at the center. 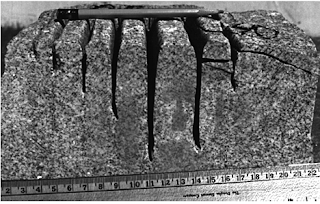 As a result the material will not be cut as deeply, and as the slots shown in Figure 2 illustrate, the cut will, as a result taper in on both sides. In many applications, where the material to be cut is relatively thin, or where the exact alignment of the edge is not that critical this may not be important. However there are applications where edge alignment is required on the order of a thousandth of an inch or two over the part thickness, with the part being half-an-inch or more thick. One way to achieve that precision of cut is to slow the traverse speed down. If the jet is moving slowly enough then there will be enough particles hitting the material at the edge of the cut, that the edge will be cut vertically downwards. Figure 3. 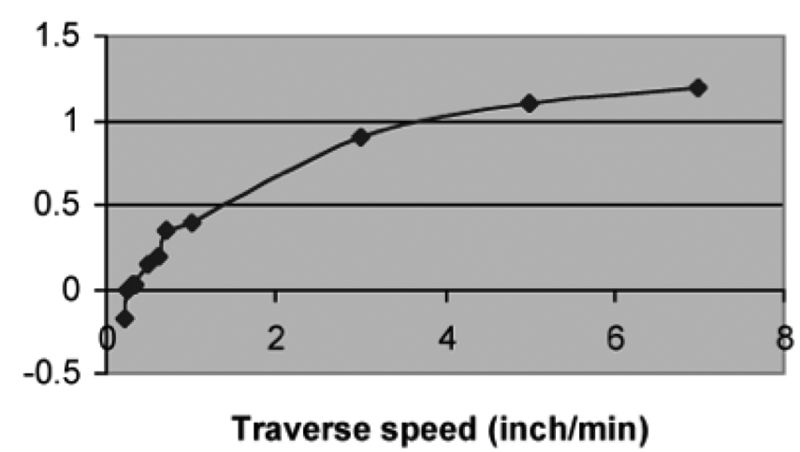 The effect of traverse speed on the edge taper angle (in degrees) in cutting titanium. Notice that, because the jet tends to flare out a little as it moves away from the nozzle, the taper angle goes negative if the speed falls to too low a value. In this particular case the nozzle was moving across the surface at a speed of about quarter-of-an-inch per minute. To get enough particles on the sides of the jet to cut a parallel slot edge, however, means that much of the abrasive in the center of the jet is not doing any work, but is rather being powered up and paid for to no real advantage. Thus, in most cases, (though not all) cutting very slowly to achieve precision on the residual edge of the cut is an overly expensive way of achieving the precision. Given the relatively small angle that the taper cuts it is usually more cost-effective (providing the table allows this) to slightly tilt the cutting head, so that at higher cutting speeds the taper is effectively removed on the edge that is left. Obviously the taper on the piece of material being removed is made worse, but if that removed piece is going to be cut later into a different shape for another purpose, then this excessive taper on the initial surface comes with no great cost. 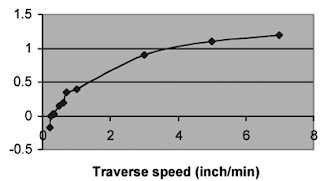 The taper angle and the speed relationship will vary both for the material being cut, as well as for the different parameters of the abrasive waterjet, and so – as with most cases where this sort of precision is required – a small test program to establish the best parameters for the cut will be needed. There are other ways of achieving this precision in cutting. One is to make multiple passes over the surface, with the jet removing only very small increments of material at one time. Again if this is carried out carefully and precisely the edge quality can be maintained, at the same time as the depth of cut can be well controlled allowing pockets of material to be removed from the work piece. However that gets into the whole issue of milling material from a target, and that is the topic for another day. It brings up the inter-relationship between traverse speed and depth of cut (which combine to give the area of cut surface, which can be used in some cases to optimize the cutting performance of a system, particularly where edge quality is not that rigid a requirement). And more particularly it brings up the quality of the walls and floor of the pockets created. Figure 4. 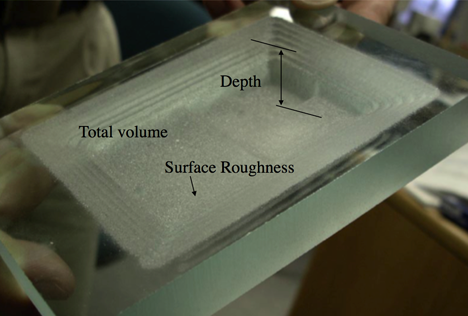 Factors to be considered in milling a pocket, illustrated by a multi-level pocket created in glass. Did you know you can create short links with AdFly and earn dollars for every click on your short urls. Bannerizer makes it easy for you to promote ClickBank products by banners, simply go to Bannerizer, and get the banner codes for your picked ClickBank products or use the Universal ClickBank Banner Rotator Tool to promote all of the ClickBank products. Tech Talk - Where to look for more oil this year.